After her appearance as the January 1981 Pet of the Month, Suzee went on to an acting career that lasted through to the early 90s, with her most notable role as Miao Yin in 1986′s now-cult classic Big Trouble in Little China. Her last known film role was in the 1993 TV movie Extralarge: Ninja Shadow and she now resides in the “Whatever Happened to..?” file. Labels: Actresses , Models , Penthouse Pets , Whatever Happened to..? Celebrity chef Marisa Churchill is well-known for the low-cal pastries and desserts she creates that don't taste low-cal. Her best-selling book, Sweet & Skinny: 100 Recipes for Enjoying Life's Sweeter Side Without Tipping the Scales will tell you how she does it. A graduate of the California Culinary Academy in San Francisco, and the Culinary Institute of America at Greystone (in the Northern California city of St. Helena, where some of the region's finest wine is made), Marisa has worked at some of San Francisco's premiere restaurants, including Rubicon, which, unfortunately and despite having several celebrity investors including the late Robin Williams, shut its doors in 2008. Marisa's TV appearances include her being a contestant on the second season of Top Chef. She's also whipped up some of her specialties on The Talk, Access Hollywood as well as a few TV shows in Greece, a country she often visits, where she also enjoys culinary celeb status. When she's not in the kitchen, Marisa, an avid swimmer, can usually be found at wherever the nearest pool or beach is. I first contacted Marisa for an interview back in July of 2012, a few months after I caught her on the show Eye on the Bay and making note of her name. She promptly replied, stating she'd be happy to do an interview with me, but it just didn't pan out. In January of this year, I decided to forward my original e-mail back to her, to see if we could then make an interview happen. She replied, it seemed like it might happen, but after a while, it still didn't look like it was going to be, so I told her I'd settle for a "one question interview" if she's just pick one of my questions to answer. So, citing her busy scheduled for not having the time to reply to all of my questions, she seemed to like that idea and answered one of my questions, and, for my patience, she said, answered a second. 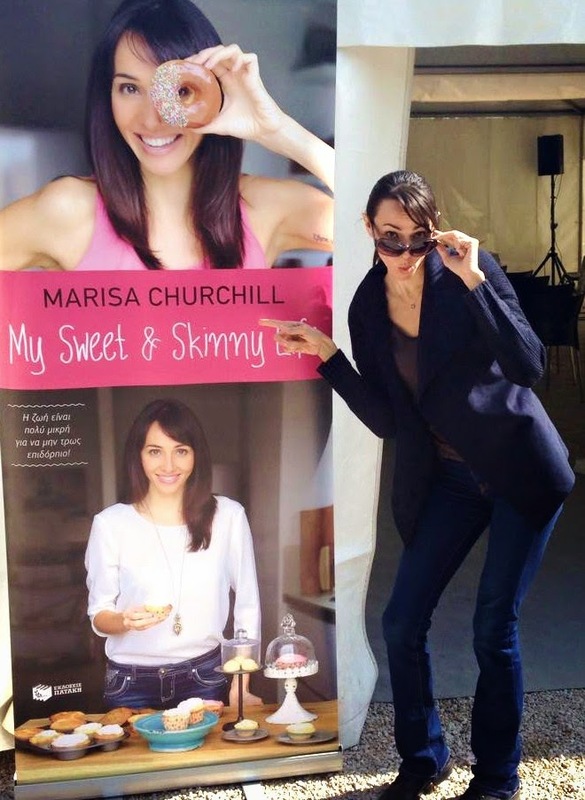 The above photo of Marisa was taken outside of the Kifissia flower show in northern Athens, Greece last month, where Marisa was on hand to whip up some of her famous Sweet & Skinny desserts for those in attendance. Born in Syracuse, New York, actress and model Jackie Dallas now resides in the San Francisco Bay Area, by way of Miami, New York City, and Chicago. Even though she was on the road to a successful medical career, Jackie made the decision to leave medicine and pursue her true passion; acting. Now being able to focus on acting full time, she's landed small parts in a few major productions, such as the soon-to-be-released San Andreas. Her more prominent roles include the very pregnant Maggie in Jay Davis' horror parody, Not Another Zombie Movie....About the Living Dead and Terrell Holden's drama, Catching Broken Glass, in which she portrays a war veteran suffering from PTSD. In addition to that, she made a recent IMDb list of the "Top 40 Asian Actresses Under 40 to Watch for in Hollywood," which is another good indication that she won't be regretting her decision to leave medicine for acting. Also an experienced model, Jackie, being a car enthusiast, got her start doing import car show modeling at an event she used to bring her car to. She currently has an impressive portfolio that includes a Mélange fashion show and a very recent RAW:natural born artists event, in which she modeled for top San Francisco makeup artist Adrianna Reloba. As of this writing, Jackie's in Atlanta, one of the cities very dear to her, where she's shooting scenes for some yet-to-be-announced film projects. Above photo by Lisa Keating. Esther Ku is a comedienne who relies heavily on joking about Asian stereotypes and blue humor in her act. Since she's cute, the dirty language and jokes get more laughs than they would if she weren't cute or if she were male. I first contacted Esther back in December of 2010 about an interview that was intended for another site I contribute to. She replied, agreed, and asked me to e-mail her my questions, which I did. She never subsequently replied, which sure didn't surprise me. I dug those questions from my sent folder last November while I was retrieving my unreplied-to interview questions for publication. But first, I decided to resend those questions to Esther, with revisions, and let her know the interview would now be intended for this site. Still, no reply and still, no surprise. Above is where a clip of Esther's stand-up act would have been. Instead, enjoy the 5-second test pattern.